Rollin’ Reckless, in orange. Photo by Jurgen Rijsdijk. 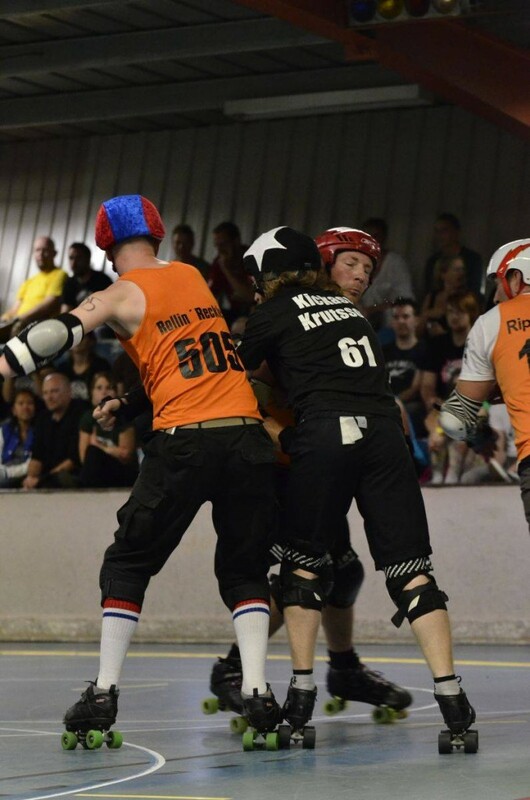 Men’s roller derby is barely in its infancy in the Netherlands but, for those driving forward the fledgling community, the chance to appear on the world stage is an opportunity not to miss. The Dutch will bring 18 skaters to the tournament, mainly from Roaring Thunder Roller Derby in Groningen, the one established men’s league started by Rollin’ Reckless in July 2012. Two more leagues are due to start in Arnhem and Eindhoven this year, which will give the rest of the squad, typically referees and coaches from the Netherland’s 15 women’s leagues, more skating opportunities. As for the national team, it was a star born out of chaos, according to jammer, Untitled Rush’n. An upcoming European men’s tournament, the Battle of the Beasts, convinced the skaters it was a good idea to come to a more formal arrangement for a national side. They hastily arranged training sessions in a couple of unorthodox venues and prepared to meet the German and Belgian teams. The Team Netherlands World Cup squad also includes skaters from Germany and England, where the men’s game is more advanced. Ben van Hurrt plays with the Crash Test Brummies in Birmingham, England; the same city which will host the tournament. Eligible for the Netherlands through his paternal grandmother, Ben is looking forward to the tournament to see how the newer sides develop. The Dutch will be one team who will have their work cut out, with little bouting experience to date. The second Battle of the Beasts tournament, in October 2013, should have been an early testing ground for skaters from various European nations but it was, frustratingly, cut short. With the big tournament on the horizon the team have been training together every month to prepare the best they can. This has included a six hour bootcamp and many of the players also appeared in the Care Bears team at the recent Kings of the North tournament in Malmo, Sweden. There will then be one final warm up bout against the Rotterdam women’s team before the Netherlands cross the English Channel to face the rest of the world. For a side that started skating in a car park a year ago, that’s not bad progress. Who will the Dutch be watching at MRDWC? I love to see Ballistic Whistle (Eng) jamming. I am excited to be playing against some of my most admired peers and to watch the teams who are less developed at roller derby and see how they get on. I’m both excited and horrified that we’ll play England, especially Sutton Impact, who made a big impression on me at Battle of the Beasts II. Of course I’m also excited to see Team USA play and I’ll cheer for our German and Belgian neighbours. I would say most skaters from Team England, particularly Reaper, but I would also love to play against Dog and Spectral Aberwraytion. There are also a couple of players from France and the USA who I will watch closely and learn from. My men’s derby heroes: Seahorses Forever (USA), Jonathan R (USA), Mr Furieux (Fra), Reaper and many more. But I also want to see what my teammates like ANIMAL, Johnny B Rude and Untitled Rush’n will do.